One of my favorite sub-genre of songs is 'songs that make getting older seem a little less scary.' I would include Jame Taylor's 'The Secret of Life' and Steve Seskin's 'When the Chain Links Up Again', and I wanted to try adding to the genre myself. 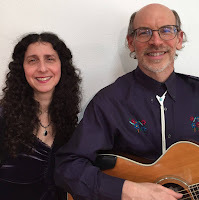 The resulting song, 'Eternity', came out like an old-time country ballad, like the kind Porter Wagoner and Dolly Parton used to sing, so I invited my friend Mara Levine to take the second verse, and the resulting duet is on my new CD The Post-American Century. Mara came to Boston recently to sing with me at the Nameless Coffeehouse, and the next day our friend Wayne Martin filmed this video of us singing 'Eternity'. Hope you enjoy it! Filling out the video band are Norman Zocher (pedal steel) and John Coffey (bass), and special thanks to key grip/stylist Rebecca Lynch for making faces at us off camera. It was edited by Chris Constantine. I should also mention my lovely shirt was embroidered in the village of El Higueral in El Salvador, and that folksinger Dean Stevens sells their products here in the US. Thanks to Mara for being brave enough to try a few dance steps, and to all of my and my wife Cindy's relatives for contributing pix for the photo gallery. (There's a quick shot of my mother, four years old, dressed as a ballerina, and a beautiful still of Cindy on our wedding day.) I hope you enjoy the song, and I hope it makes the future seem just a little bit less scary.